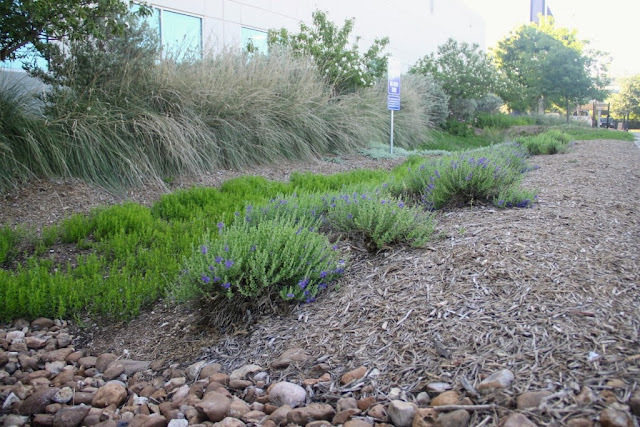 We San Antonio gardeners have by necessity sought out drought tolerant plants to use less water and lose fewer plants to the intense summer heat. 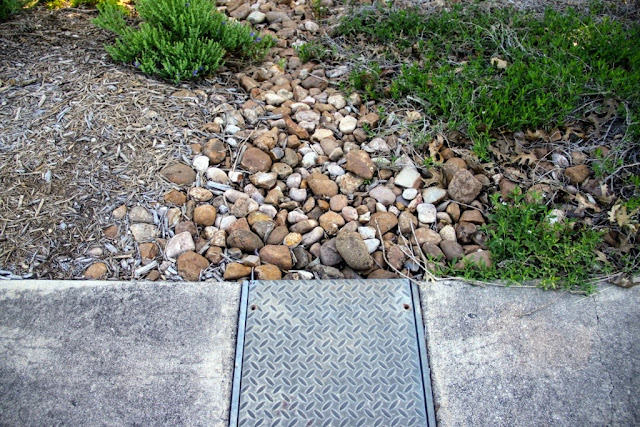 But what happens when there is too much rain all at once, when runoff becomes an issue? Recent buzz about rain gardens, which serve to slow down and filter storm runoff, motivated me to visit the Rain Garden at San Antonio River Authority (SARA) offices last Spring. 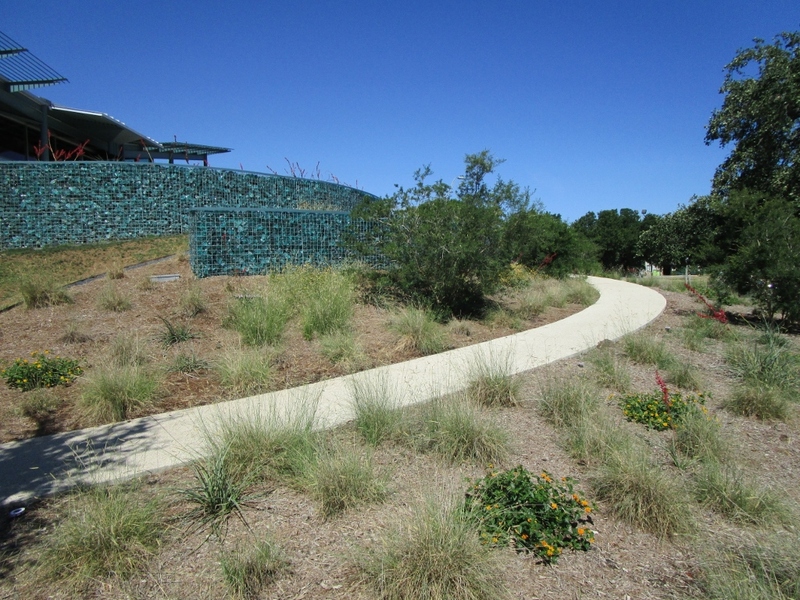 SARA protects the San Antonio River watershed for water supply and conservation. SARA's Sustainable Landscape Superintendent, Lee Marlowe, gives an excellent presentation on the concept and installation of this rain garden so I'd learned quite a bit about it in advance. If you're in San Antonio, Lee currently stars in a SARA public information TV spot featuring this rain garden. While SARA's main office is south of downtown along the River Walk, this office with the rain garden is at 600 East Euclid just north of downtown. Let's see how pros do a rain garden. The purpose of a rain garden is to slow down and filter rain water before it reaches our water sources. 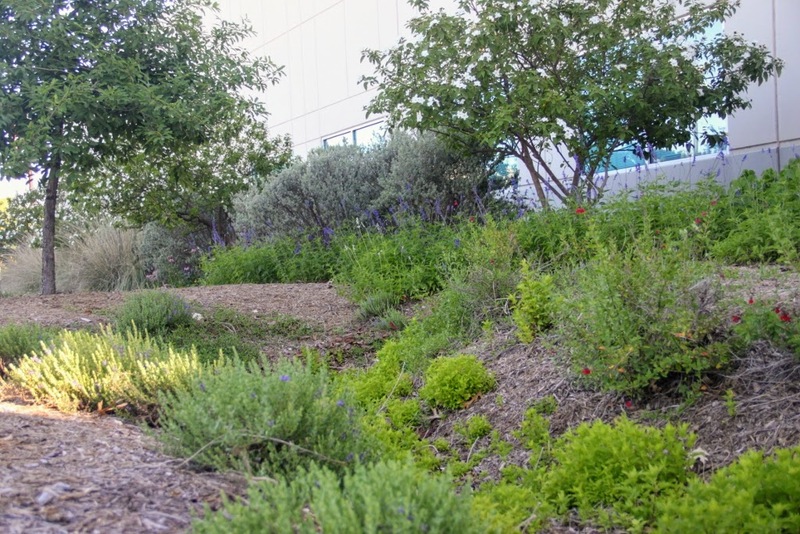 When I first heard about the SARA rain garden I envisioned a channel with rocks in the bottom. This is way more than that. I should have known better since the plants were selected by Lee and her team. 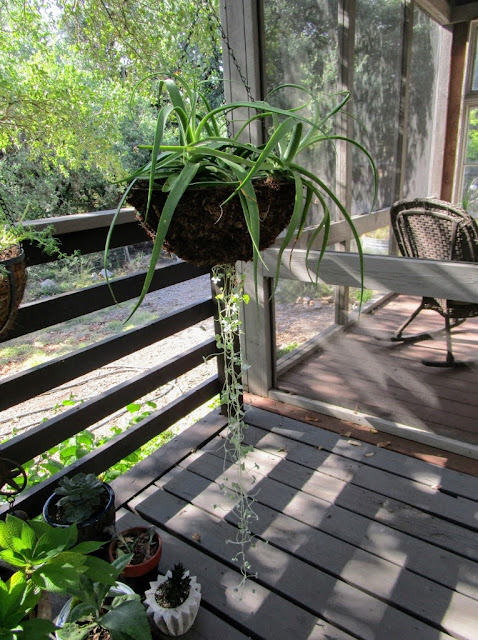 Lee, aka "the plant lady" for SARA, is a native plant expert who can rattle off the ID of some pretty rare plants and the person largely responsible for restoring native plants to miles of San Antonio River banks over the past few years. Her expertise shows in this beautiful urban garden. Did I mention urban? I-35 is right there in the background so all the freeway goop washes off onto their property during rain events. Downtown San Antonio is just on the other side of the freeway. SARA's rain garden also filters runoff from 9,000 s.f. of roof so it's a little deeper and larger than most rain gardens which is why they used heavy construction equipment. 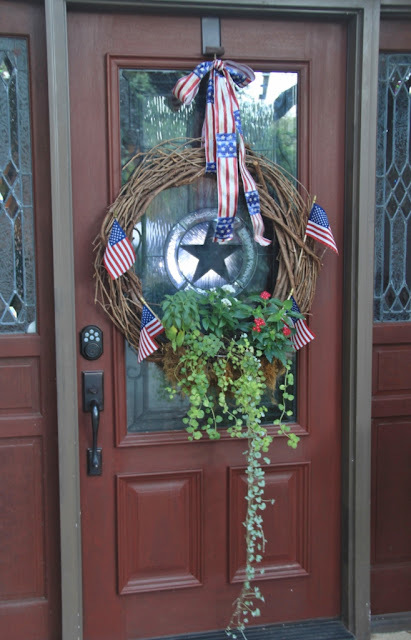 While not something you'd have available for your yard we can find plenty of inspiration and ideas to take home. 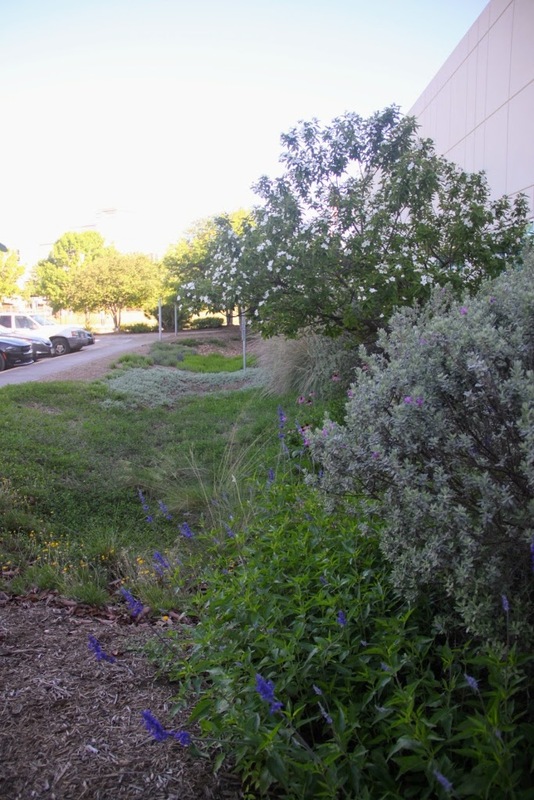 LID or Low-impact Development features such as rain gardens are taking on more importance as cities like San Antonio assess fees for impervious surfaces to raise funds for drainage improvements. 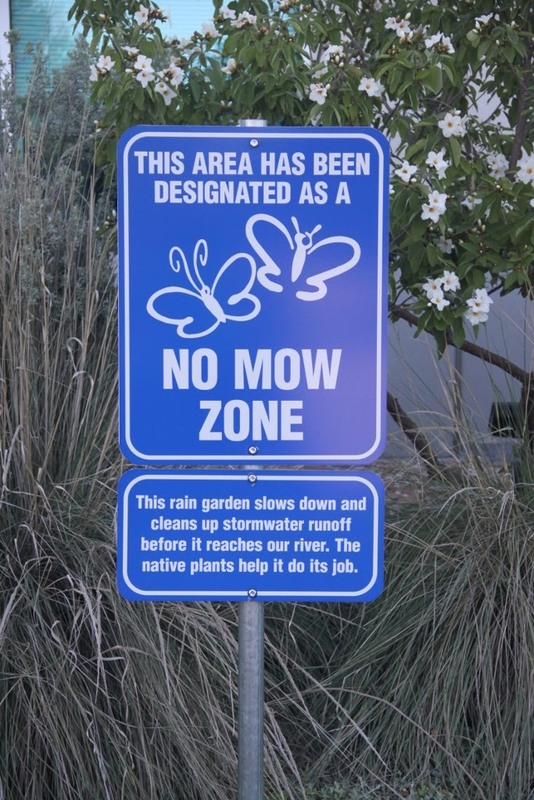 A no mowing sign in case there are questions. 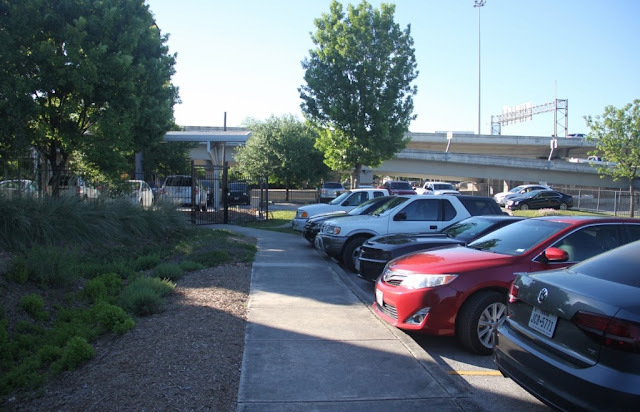 The site was a flat, boring strip of lawn just like this area along East Euclid Street near the SARA visitor entrance. 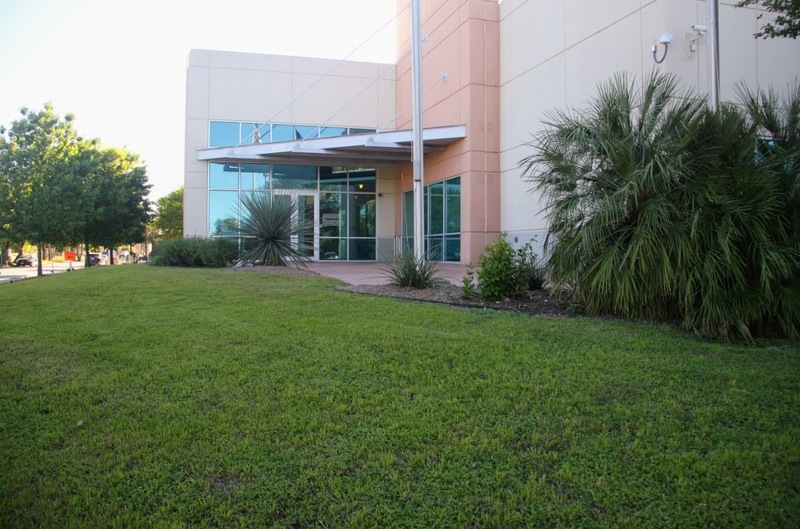 To the right is the rain garden running along side the building. 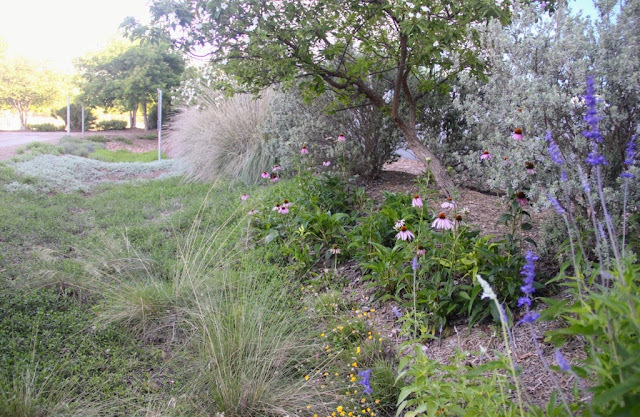 All these plants are commonly sold in local nurseries making the rain garden an example for the community. 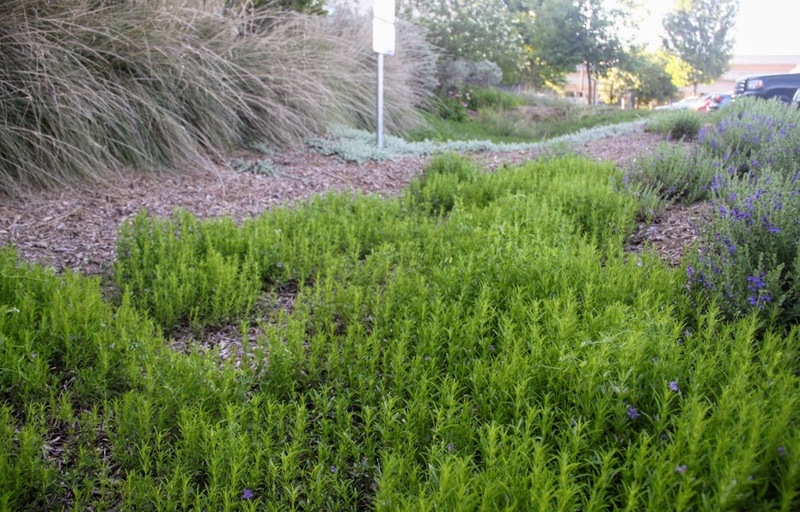 Dyschoriste linearis or Snake herb fills the bottom of the channel to filter the tainted rain runoff. Scutellaria wrightii blooms add color. 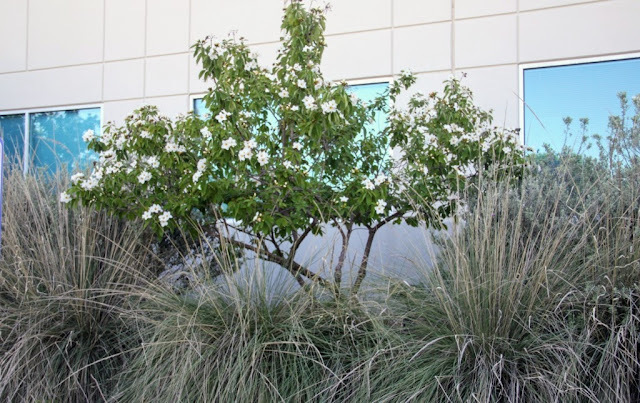 Mexican Olive (Cordia boissieri) trees run at intervals along the building with Texas sage, Leucophyllum frutescens filling in under the windows. 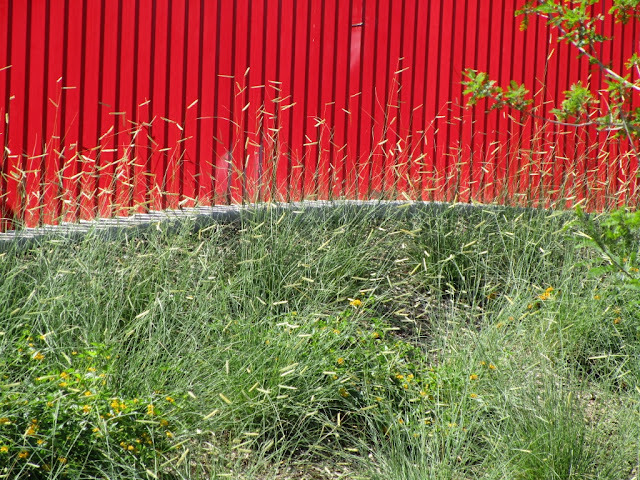 Muhlenbergia lindheimeri grasses add another layer of texture along the row. In her presentation on this rain garden, Lee notes the amazing number of species of birds, bugs, and butterflies that have flocked to this previously wildlife free zone. I was here a little early to spot much in the way of activity though she did ask about my observations. 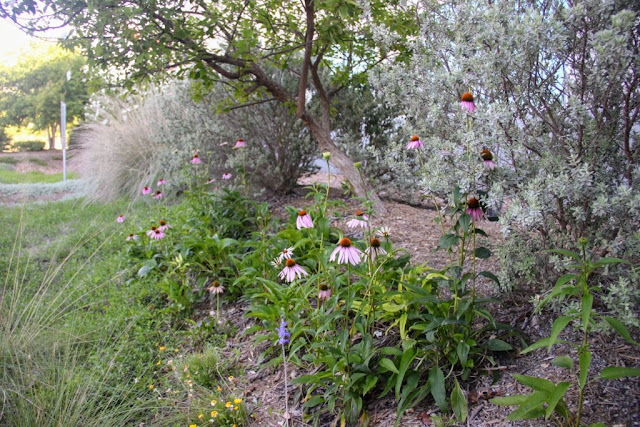 A gray swath of Woolly stemodia stands out among the green while Purple Coneflower (Echinacea purpurea), Mealy Blue Sage (Salvia farinacea), Gulf Muly (Muhlenbergia capillaris) a little lower on the slope and orange-gold Four-nerve daisy (Tetraneuras scaposa) add color to the mix. Wish I could grow coneflowers like these. They should be easy to grow but for some reason I've killed way too many of them. Time to try again. A small field of white and yellow Blackfoot Daisy (Melampodium leucanthum) topping a rise combines beautifully with Four-nerve daisies heading down the hill. Well done SARA team! A rain garden to be appreciated as a beautiful, functional native plant garden. If you haven't seen Lee's presentation on this garden yet I highly recommend it. Follow San Antonio River Authority and SAWS (San Antonio Water System) on Facebook for notification. 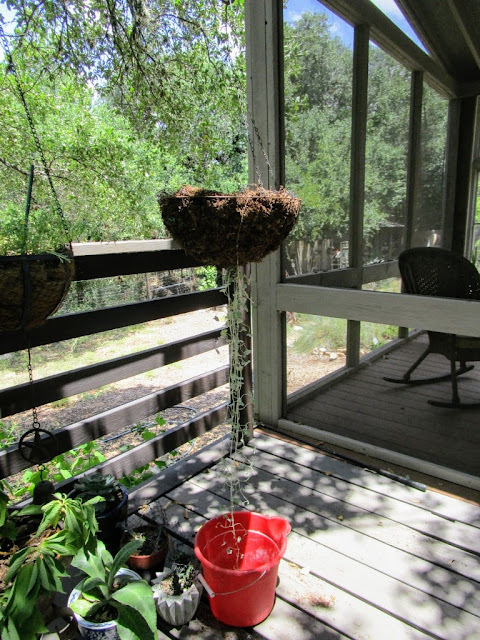 Now where can I place a rain garden? Mine would obviously be a modified version. There may be incentives on the way soon. While San Antonio lowers impervious surface fees for commercial properties with LID features, there is no similar option for homeowners at this time although this oversight will hopefully be corrected sometime in the future. 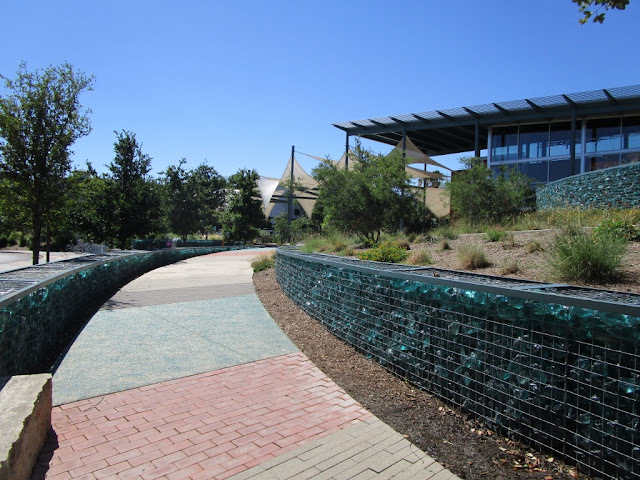 The DoSeum, a kid's museum in San Antonio, opened in June 2015 and the landscape has been catching my eye ever since. 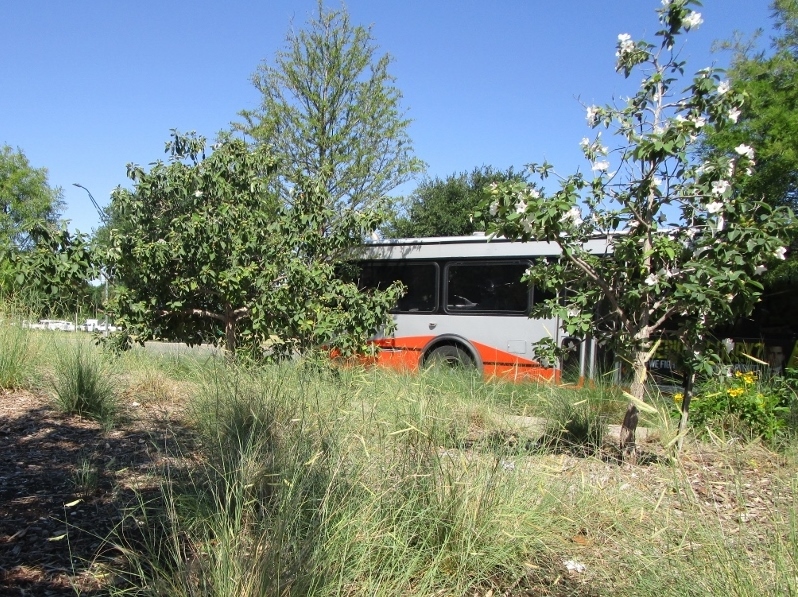 For the last two years I've passed this landscape on Broadway just north of downtown and intended to stop. A few weeks ago I did just that. 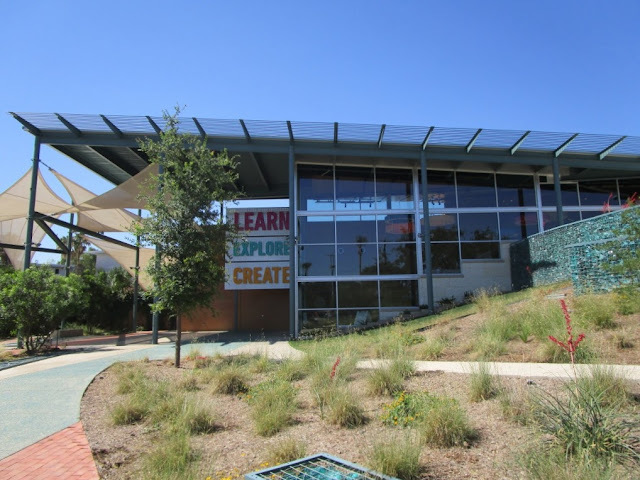 This may be a children's museum but the landscape is fun for grown-ups too. Impossible to miss a bright red wall along Broadway, a major north-south artery connecting downtown with close-in suburbs. 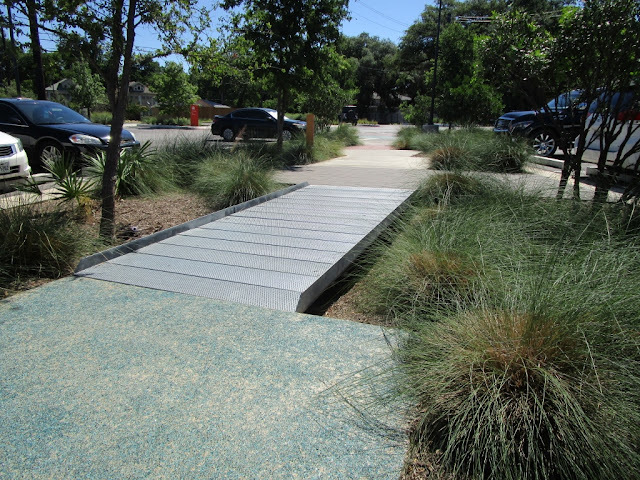 San Antonio's Lake|Flato Architects, the museum's designer, and Austin's Ten Eyck Landscape Architecture collaborated on the project. The two firms have worked together on several local sites recently and the results are always excellent. 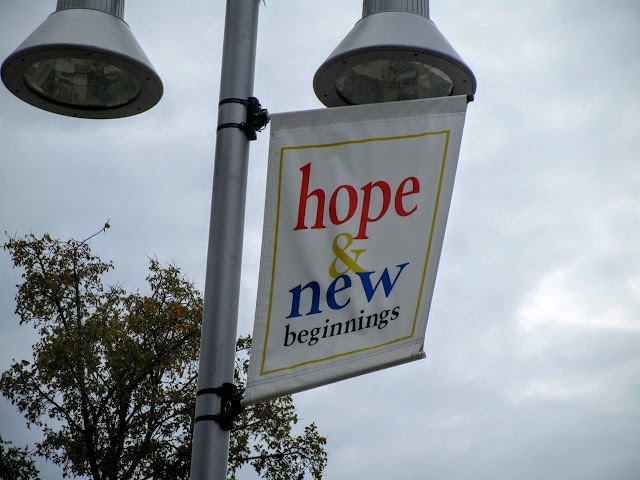 See my post on landscapes at The Pearl here. A block-long striking red wall (bright as it looks) gets attention on busy Broadway which also serves as the gateway to our Museum District and the Pearl Brewery mixed-use redevelopment area. Gabions filled with aqua glass cool that hot red wall color. 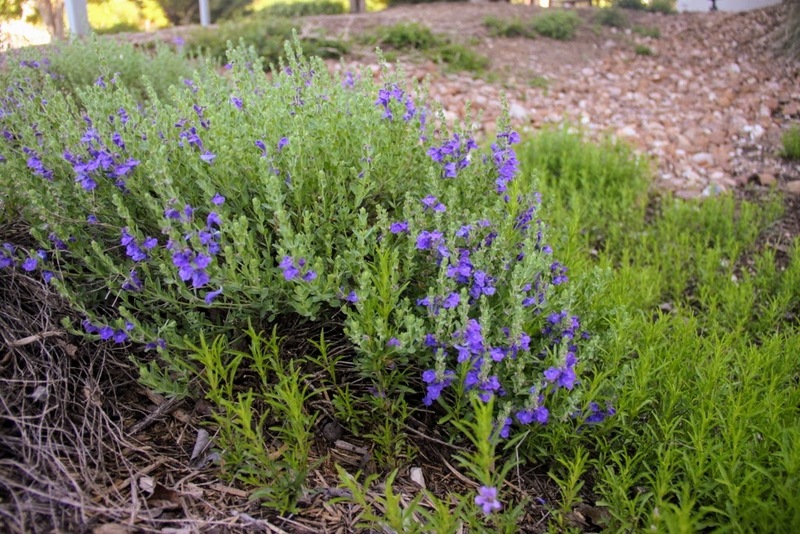 Texas sage (Leucophyllum frutescens) sits on a filled slope behind the wall. Spots of bright red color show through softening trees. 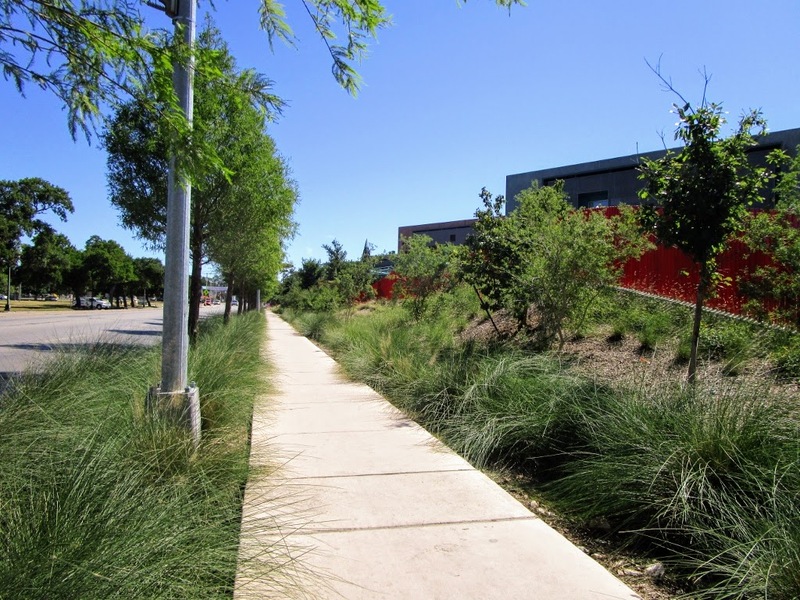 Gulf Muhly (Muhlenbergia capillaris) softens sidewalk edges and should be spectacular in full cotton-candy mode during fall bloom. I'll try to return to see how all the fluffy pink works with the red wall. The bus stops here. Our Via bus system has a museum route plus a Trolley for visitors. Mexican Olive trees and a bright yellow Esperanza are there to greet you. Imagine that wall as seen from the bus. I'd ride out from town to see this. Bouteloua gracilis 'Blonde Ambition' looks best against a bright, solid background. 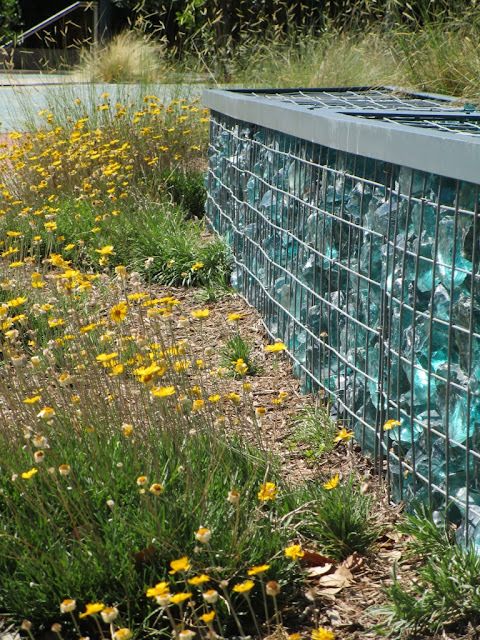 A peek inside the gabion revealed the center is filled with rubble rock but there still seems to be plenty of shine on all sides. 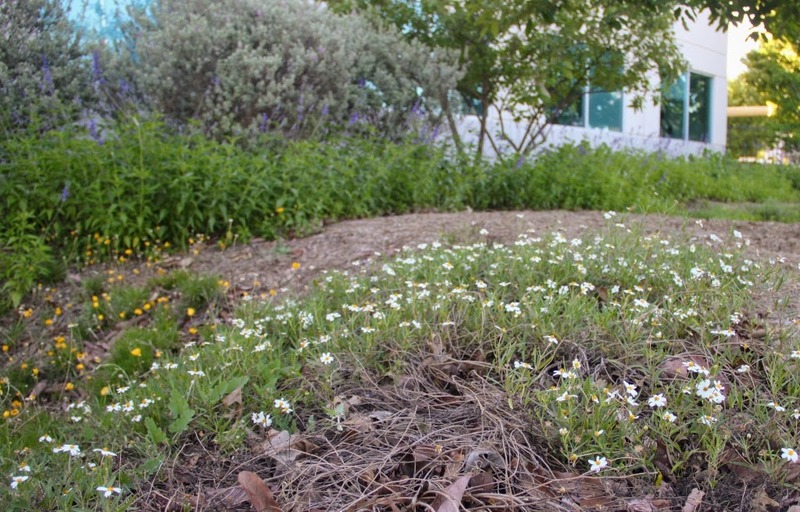 Four-nerve daisy (Tetraneurus scaposa) is thriving in a west-facing location. A curving hillside seems the perfect location for gabions. Matching aqua recycled glass granules pressed into concrete at intervals repeat the color and a mix of textures make this a decidedly not boring sidewalk. A few of the grasses are struggling on the slope. Still looks good with dots of gold lantana. I'd follow the aqua spiral up the hill but it's getting hot out here! 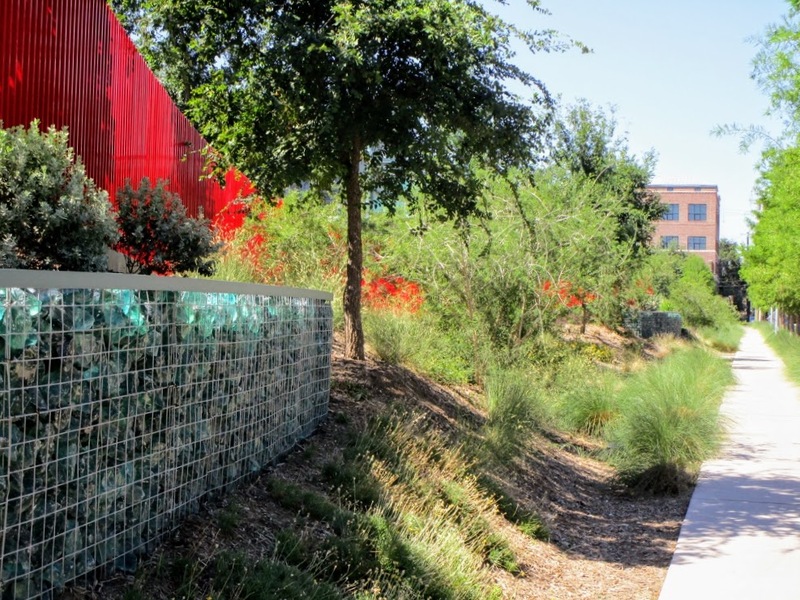 We'll turn to the cooling welcome of the museum entrance and the "place-based" design of Lake|Flato which draws inspiration from traditional buildings of South Texas. With this approach, even the firm's earliest projects (now at 30 years) don't seem outdated. 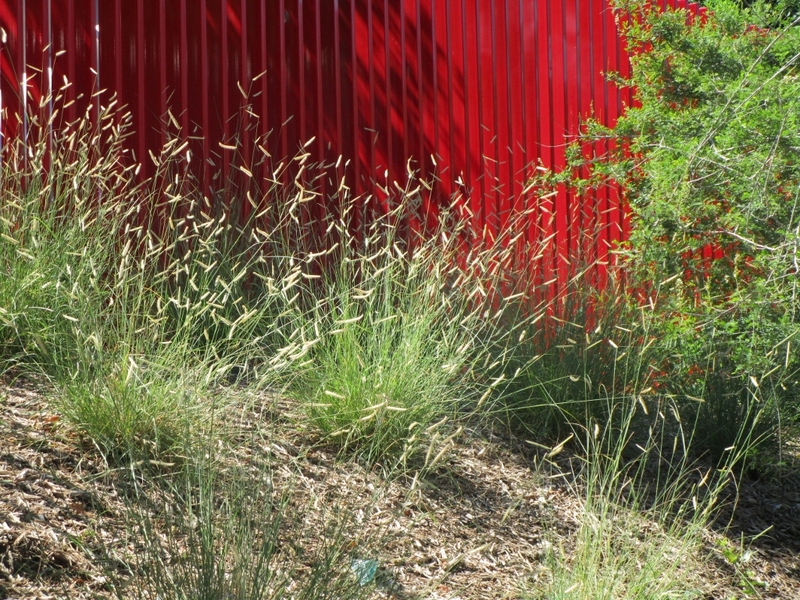 Hesperaloe parviflora 'Brakelights' punching in more red accents brought over from the streetside wall. 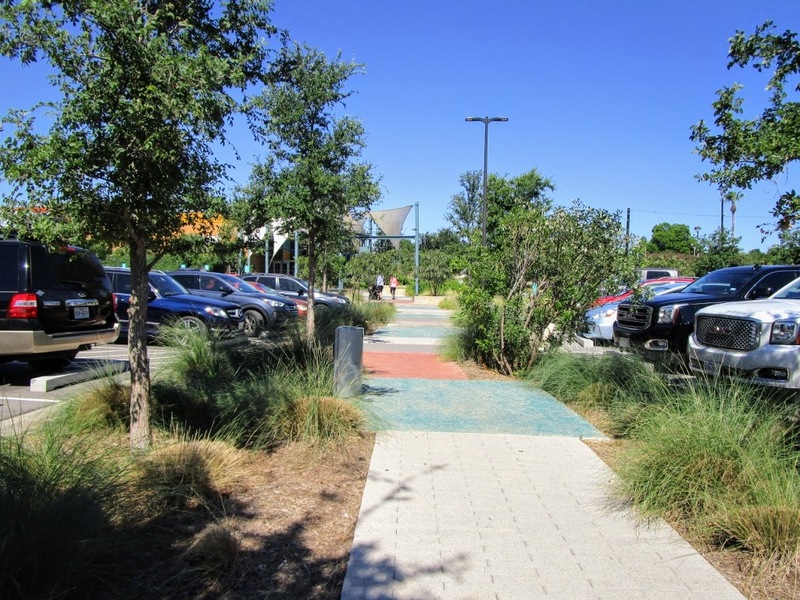 Thoughtful architecture includes a walkway for families to safely navigate the parking lot. 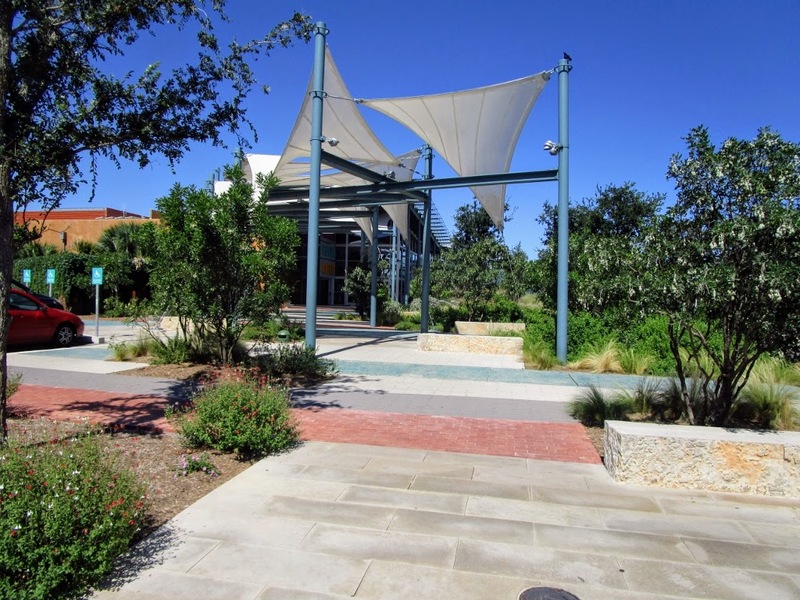 Stroller and wheelchair-friendly access with shade sails to help beat the Texas heat. 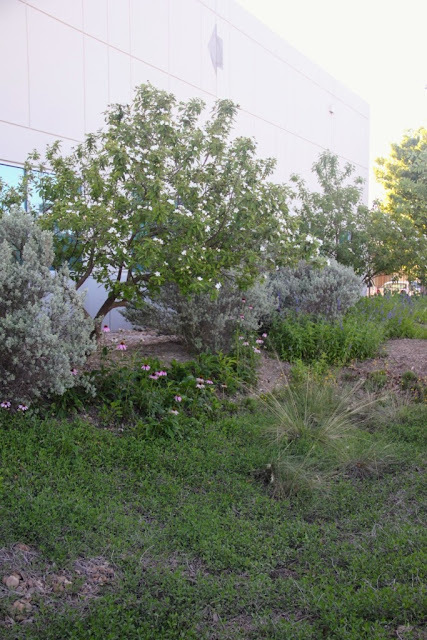 Texas Mountain Laurel (Sophora secundiflora) in raised planters with softening effects of Mexican Feather Grass and Salvia greggii alongside. Back the other way, planning ahead for our inevitable deluges. This is how it's done. One of my favorite things about Christy Ten Eyck projects is most of these plants are already in my landscape or readily available at local nurseries and are a main reason for stopping: plant massing, repeating colors, varying textures--all good ideas to consider. We won't have to wait long for Ten Eyck's next project which is expected to open just around the corner at the San Antonio Botanical Garden in October. Looking forward to seeing what she does to follow this wonderful DoSeum effort. 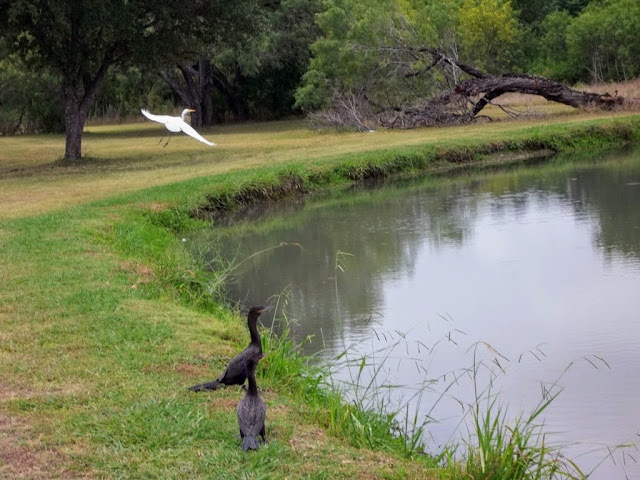 It's Wildlife Wednesday and that means rounding up wildlife photos from June to share on the meme hosted by Tina at "My Gardener Says...." on the first Wednesday of each month. Let's look at the wildlife visitors I spotted recently in the garden. 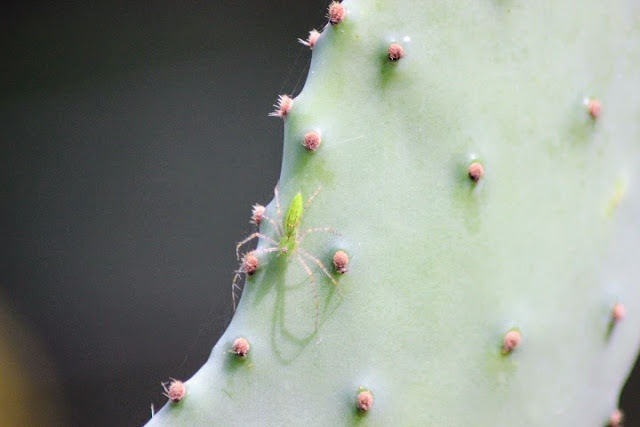 This pretty creature is a Peucetia viridans or green lynx spider. Green lynx spider is found throughout the southern U.S. and is a chief predator of southern pests such as the cotton bollworm, corn earworm, and cabbage looper moth. It doesn't spin webs, but rather trails a line along behind like a trip wire, waits for prey to show up and pounces. "Have a nice trip? Ha Ha." You can see a bit of what looks like a line between the glochids. 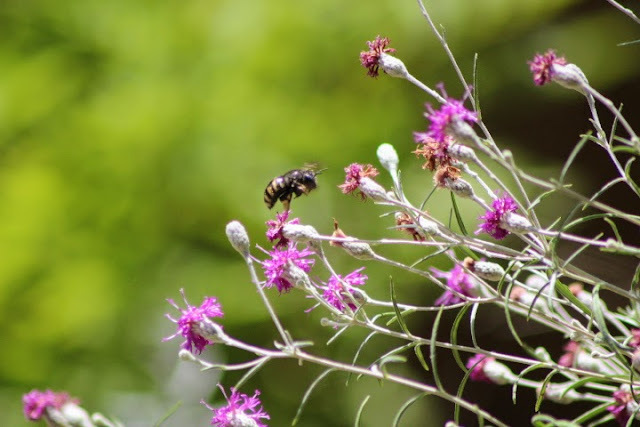 It's not all good with the green lynx spider since they are also a major predator of bees which might explain its presence on a cactus just to the left of Woolly Ironweed (Vernonia lindheimeri) where a Solitary Bee is working. These Solitary Bees are actually very friendly and often come up to us just to take a look. 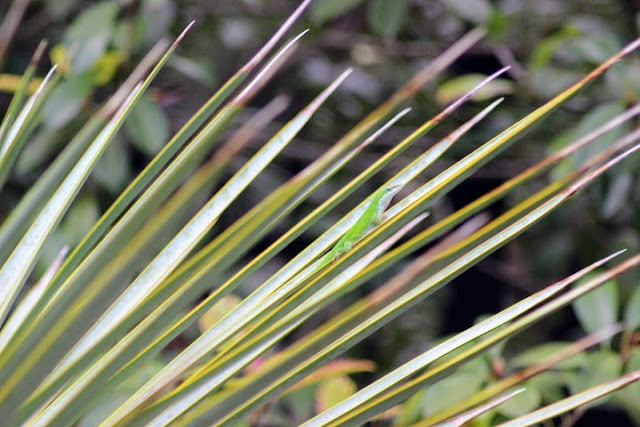 A green Carolina Anole (Anolis carolinensis) keeps an eye on the proceedings from a Yucca Rigida while waiting for insects to fly close enough. Anoles claim plants, particularly tall ones and simply hang out there. I heard one snap at a moth a while back and it's quite audible if you're in the right spot. Turkey Vultures have been visiting us on a near daily basis for years. Usually it's a thudding noise on our metal roof that alerts me to their presence. They typically perch high up by the chimney, all the better for their view of the creek, but not easy to get a photo. During June they moved closer to the water trough we keep out for wildlife and I created these GIFs. Something may have died back there, a fairly common occurrence which is why they perch on the roof in the first place. Our golf course correspondent turned in this view of an Egret and Cormorants fishing at a pond. I typically conclude these posts with deer photos. Today I'm posting deer damage instead. Deer are creatures of habit and once they gain a taste for a certain plant they won't leave it alone. Every new leaf is stripped nightly. 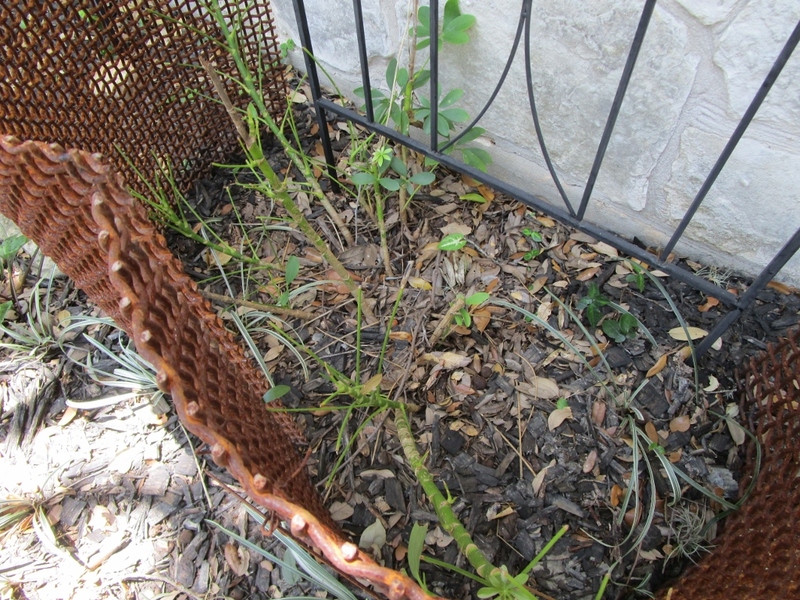 When we discovered this type of damage to a schefflera that had been near the front door for years without a problem, we protected it with wire grates assuming the baffled deer would move on. 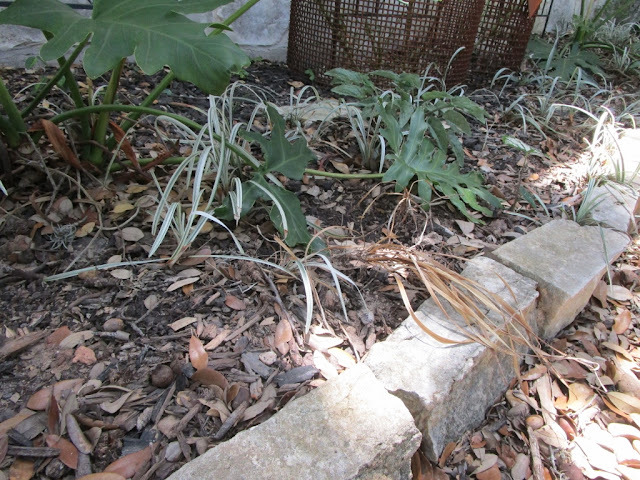 Yesterday I discovered the deer apparently decided to destroy nearby variegated liriope plants instead. Chewed down whole rows of them. Deer typically nibble liriope randomly but not enough for me to worry about it. 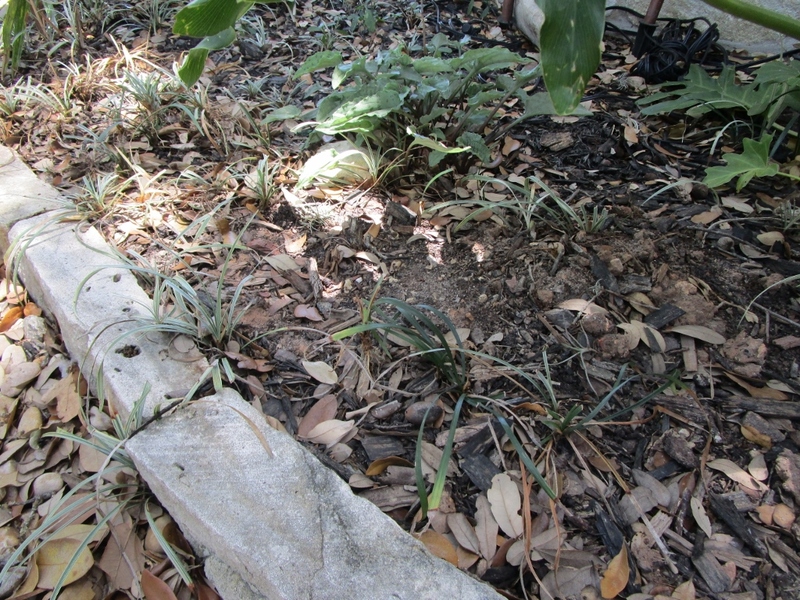 This time whole plants were uprooted and dropped. Fortunately, liriope is resilient which why it's planted here. I've mentioned that we fenced deer out of the back garden a few years ago and these examples in the unfenced front yard show why. Imagine going out and checking each morning to see what the deer got into overnight. For more posts on wildlife in the garden, see the comments section at "My Gardener Says...". Wherever you celebrate, enjoy our nation's special day. Dichondra Silver Falls has reached the doorstep so these plants will be transplanted to the garden and I'll fill in with succulents for the next few months. Succulents are easier since they require less water and keeping the basket watered has been a challenge.